have you ever thought about just getting in your car and drive, destination unknown, just keep on going, no turning back? i had that experience today, got on my motorcycle from belmont and just kept on going west on route 2A, until 30 miles later i was in ayer, massachusetts, a town i had never to before in my life. it was my farthest motorcycle ride to date. today's weather was perfect for riding. motorcycles are all about freedom, and though having a lovely biker chick riding in the back wouldn't be so bad, riding on my own with the wind in my hair (well, on my helmet anyway, there are still helmet laws in massachusetts), just cruising miles after miles of open roads, it is absolutely one of the best feelings in the world. years later, when i'm old and grey, these are the kind of days i will be thinking about, the road as a metaphor for life itself, leaving the past behind me as i plow blindly into the future. bikers are barometers, the better the weather, the more of them (us!) come out. when the weather is as nice as it was today, it's like a call to arms for anyone who's ever biked before, there's a certain longing deep within the soul to be on something with 2 wheels traveling fast down some road somewhere. yesterday would've been a great day to ride, but today was equally great. my arm got tired waving to all the bikers i passed. at one point i went by a squadron of 30+ bikes going in the opposite direction, we flashed hand greetings as we sped by each other, i had goosebumps afterwards, to think i could somehow be a part of a motorcycle gang! as befitting such a great motorcycle day, i also passed the place where i took my rider's course a few years back, everything coming full circle. in terms of safety, the route 2A corridor is much safer than the storrow drive route i ride on occasions. the speed limit ranges anywhere from 25mph to 45mph, but people usually drive about 10-15 miles above the posted limits (storrow drive is 45mph, but people go 65mph+, and its very windy with no breakdown lanes). i was chewing gum (with my mouth closed, i learned that the hard way a few years back), occasionally humming "ain't no mountain high enough" by diana ross. the further west i went, the more rural the landscape became. i passed fields, cows, horses, goats, even a rock quarry. i went just far enough so that i had sufficient fuel for my return trip. before i went back though, i parked the bike, stretched out my legs, took a reading with the gps, snap a photo, and called my father on the cellphone to let him know where i was and that i was still alive. i put back the helmet, slipped in the gloves, threw on the sunglasses, then went back home to cambridge. back at the house, andrew was there with his friend yentz. the three of us watched another red sox victory over the marlins (especially that part where a female spectator on the green monster seats got beamed in the throat with a flying homerun baseball), before we went our separate ways. i went across the street to star market to get a 2 litre bottle of raspberry ginger ale, my contribution to the block party that would soon be happening. it was actually supposed to be last sunday, but got postponed due to the rain. 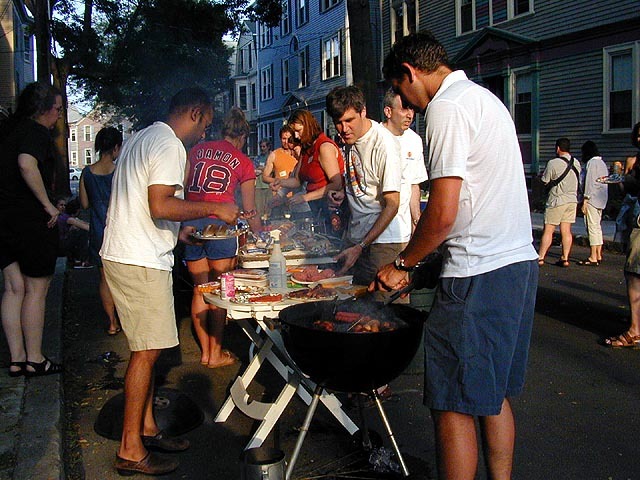 a segment of my street was blocked off and all the neighbors came out for a barbecue and to meet one another. there were people who'd lived in the area for decades, parents with small (and not so small) children, and new people (like myself) who've recently moved to the neighborhood. i actually had a chance to go to the block party last year, but i had just moved in and wasn't in the mood to meet anyone quite just yet. a year later, not much has changed. after i had a few cups of raspberry ginger ale, i went back home. i would've stayed for the entire duration of the block party were it not for the fact that my parents were having a barbecue in belmont. my sister, my 2nd aunt, my aunt lili and my uncle matthew, my godmother and her two sons, suhan, and for some reason, our next door neighbor, a nice couple who recently had a baby along with the wife's chinese speaking parents. my godmother gave me a cheese grater (G5!) and a teakettle as gifts. the neighbors left soon after i got there, which meant more food for me. barbecued porkchops, lamp shishkabob, corn on the cob, jumbo shrimps, abalone, bubble ice tea, cold green pea soup, peach pie, and of course roasted marshmellows. by evening's end, i took the motorcycle back home to cambridge. the weather was still warm enough that it felt pretty good riding back. usually night time is a bad time to ride because it's cold. i had taken out my contacts and put on my glasses (my usual goggles is missing one of the lense). my father stopped by briefly to give me the bike alarm after he dropped off my 2nd aunt and suhan.